Two old men, with a combined 60 years in Annapolis and 80+ years in public office, are complaining about a female delegate’s 30 years of government experience. At least that’s the message we are taking away from the latest misleading mailer from the Maryland Democratic Senate Caucus Committee. The committee, as we have mentioned before, is run by Senate President, Mike Miller. 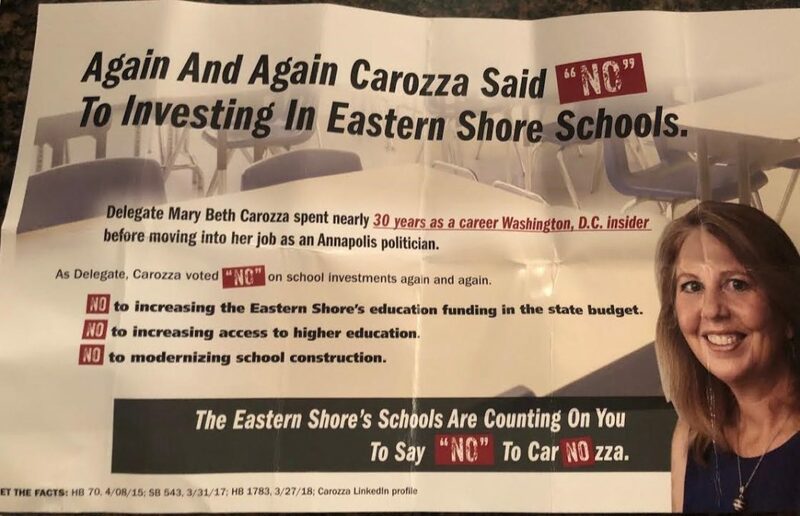 The mailer is designed to attack Senator Jim Mathias’ opponent, Republican Delegate Mary Beth Carozza as “Washington Insider “ who voted against education on the Eastern Shore. If you don’t already have whiplash from witnessing the cynical feats of logical gymnastics, and outright lies in Miller’s past mailers this election cycle, be warned that this one might lead to a case of vertigo. Does Mary Beth Carozza have a long history of government service in Washington? Yes, and that includes her time as a Deputy Assistant Secretary of Defense where she was awarded the Secretary of Defense Medal for Outstanding Public Service for her actions at the Pentagon on 9/11. Carozza kept open the lines of communication between the Pentagon and Capitol Hill after the terrorist-hijacked planes hit the building. Only two washed up old men would attack an accomplished female public servant for her actions on 9/11. The“education” votes Miller and Mathias ding her on are hardly bills that parents, teachers, and taxpayers are losing sleep over. For the record: Jim Mathias voted for the bill, then voted to uphold the Governor’s veto. Making sense of Mathais’ legislative record is just as dizzying as trying to discern any logical consistency from Miller’s campaign committee. Criticizing a vote to protect our students from potential sexual assault? Brilliant move Mike! Carozza voted against HB 1783 the infamous “back room bill” that stripped school approval authority for school construction from the Board of Public Works. It’s called the “back room bill” because the amendment cutting out the Board of Public Works was added literally in a back room off the Senate floor during a floor session on a bill to modernize the administrative processes for school construction. The amendment, devised by Miller and Speaker Mike Busch, was political retribution aimed at Comptroller Peter Franchot for having the temerity to ask that kids in Baltimore County and Baltimore City have air-conditioned classrooms. Attacking Carozza for voting to uphold his move to eliminate transparency and fiscal responsibility over hundreds of millions of taxpayer dollars doesn’t seem all that politically astute. Top notch Mike, top notch. This is Mike Miller at his cynical worst, sending craven political hit pieces at his opponents that upon closer scrutiny do little more than highlight his own malfeasance. Guest Column: Are MoCo Republicans Angry Enough?